I recently switched from satellite to cable TV, leaving me with two DirecTV receivers that have no resale value and aren't suitable for contribution to a charity like Goodwill. I hated the idea of chucking them in a landfill, because home electronics contain toxins such as mercury and lead, so I started looking into electronic recycling options. The nearest option in North Florida appeared to be Scrap Computers, a company in Jacksonville that collects small electronics for free and larger items for a fee. I found a better idea on a DirecTV message board: Staples stores began collecting electronics for recycling in 2007. The local Staples took the receivers for recycling at no charge, bagging them up at the customer service desk. For decades, the league used the threat of its "Condemned" rating to pressure filmmakers to clean up their movies, quitting in 1980 with the condemnations of American Gigolo, Dressed to Kill, Friday the 13th, Little Darlings and Used Cars. By that point, they must have seen the writing on the wall. I was Catholic and 13 that year -- exactly the kind of menaced youth they were trying to protect -- and I saw four of those films the second they made it to cable. Spc. Christopher J. West, 26, of Arlington, Texas, died Feb. 4 in Balad, Iraq, of wounds suffered on Feb. 3 in Muqdadiyah, Iraq, when an improvised explosive device detonated during combat operations. He was assigned to the 1st Squadron, 73rd Cavalry Regiment, 2nd Brigade Combat Team, 82nd Airborne Division, Fort Bragg, N.C.
West is one of my relatives by marriage -- the brother-in-law and extremely close friend of my wife's nephew. 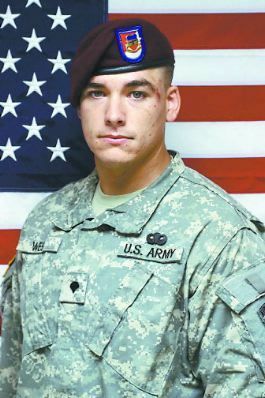 His family told the Fort Worth Star-Telegram more about the life of the Texas A&M graduate and fourth-generation soldier who joined the Army in 2007. Spc. West was a combat medic, and was scheduled for rest and relaxation at his family's home in Arlington this weekend, according to his sister, Lauren West, 27. "It was going to be his last mission before he came home," she said. "He loved what he was doing. He said he felt like he had found his calling. He thought that it was very possible that he could make the Army a lifelong career." My heart goes out to his family and friends back in Texas and the people who knew him at Fort Bragg. Shireena Adams has gotten $15 in child support over the 11 years she's raised her granddaughter, creating more than a little financial strain. "I'm thinking about giving up my car. Most the time it just sits there because I don't have enough money for gas and insurance is expensive," said the 61-year-old whose severe arthritis has her living in an Indiana apartment on $1,065 a month in disability. Turns out the state has collected more money from the girl's father but failed to pass it along to Adams. State officials said they couldn't find her -- even though a simple Internet search would have done the trick. A lot of states are sitting on money that was collected for child support on behalf of caregivers. The federal government is urging action, but not in the way you might expect. A new report from the U.S. Department of Health and Human Services Office of Inspector General urges states to spend the unclaimed money -- some on federal administrative costs for child support programs and the rest on the state's general budget. A couple of teen girls in Boynton Beach, Fl., may be the worst criminals in the world. They allegedly mugged a pair of Girl Scouts on Wednesday for $167 in cookie money, drove off, then returned to the scene later to taunt the scout and talk to a TV reporter. "We went through all that effort to get it, we got all these charges and we had to give the money back," one of the teens told TV station WPBF. "I'm kind of pissed." As if this story weren't already surreal enough, WPBF's web site runs video and a picture of the accused muggers, but then explains that "names are not being released because they are minors." The Long Bet Foundation, the group that sponsored a five-year wager between blogging evangelist Dave Winer and New York Times executive Martin Nisenholtz over the journalistic value of weblogs vs. the media, announced today that it has declared a winner. The foundation used the same source I did to pick the top five news stories of 2007 -- a vote by Associated Press editors and news directors -- and reached the same conclusion: Weblogs won. Adding up page rank winners blogs win 4 to 1. Adding up page rank winners of user submitted content vs. commercial content, user submitted content wins 3-2. If you average page ranks of the NYT (avg rank 56.2) vs. blogs (avg. rank 13.2) Blogs win. If you use an average rank of user submitted content (avg. rank 8.8) vs. commercial (avg. rank 1.8) Commercial news outlets win. My unofficial declaration of a winner generated a lot of debate here on Workbench and other blogs. People challenged almost everything -- the language of the bet, the news value of weblogs and the mainstream media, the relevance of Wikipedia and my own judgment -- but there was one player in this drama that nobody questioned. Everyone accepted as a given that Google's search results would be useful to people looking for news, whether the top-ranked articles came from blogs or the Times. For broad keywords like these, Google's a crappy news-gathering tool in its regular search results. You have much better luck with Google News, but it's not an egalitarian arbiter of news trustworthiness that could settle a bet. Google hand-picks the media sources indexed by that service, favoring mainstream media and excluding blogs. Schulz and Peanuts, by David Michaelis, is a completely absorbing, stunningly researched, pain-scorched biography of the last century’s most influential cartoonist. Charles Schulz's genius was built on traits common to great artists: unstinting discipline, narrowness of focus, solipsism, arrogance, self-doubt, independence, competitiveness, an embracing humanism, hunger for the new, a sense of unquenchable aloneness, and a taste for passive aggressive revenge. I knew enough about Charles Schulz going in to understand that his avuncular public image belied a lifelong sense of torment and so wasn't shocked or surprised to learn of his dark side. What did startle me was just how autobiographical Peanuts turns out to be. I'm eager to read this book. Though Schulz' widow Jeannie has publicly rejected the portrayal of her husband as someone who "couldn't love and couldn't believe that he was loved," there's an oppressive gloom to Schulz that I've always found fascinating. I read every Peanuts paperback I could get my hands on as a kid, identifying with the block-headed kid who could never catch a break, yet never stopped thinking Lucy might let him kick the football.